Have you Heard about EcoBricks ? Let us know if you hear of any local initiatives. STOP PRESS...……………………….You can take your Poppy to the Town Hall any time before 30 November and they will be taken to a local Sainsburys for you ! Did you know that you can recycle your Poppy? Until 30 November, you can hand in your old Poppies at Sainsbury’s stores where they’ll be sent back to the warehouse in Aylesford. Returned Poppies are then dismantled – the button and stem are used again to make Poppies for next year’s Appeal, whilst the paper petal and leaf forms are recycled. ​It is hoped to set up a recycling point in Romsey next year. Potatoes lead the way in water-saving growing tech - Another first from Walkers ? Having finally made it to Sainsburys at Lordshill last week to put my collected plastic packaging in the recycling bin there, I took this photo to show what could be put in there. However, I have just gone to Southampton City Council's website to check where the other bins are and found this...………………….. The mixed plastics recycling banks will be removed in the near future. You can still recycle your items in them. If a bank is full then please dispose of items in a general waste bin. Due to unforeseen circumstances the company who empties them has no end market for the plastics that were recycled in this bank. We apologise for any inconvenience. Snack firm Walkers has announced a recycling scheme - after Royal Mail begged campaigners not to post empty crisp packets without envelopes. From December, snack fans will be able to post used bags - in envelopes, for free - directly to a recycling company. Campaigner Geraint Ashcroft, who launched the petition against Walkers, said it was "a great first step". The company said it had been in talks about the scheme since the beginning of the year. It will involve packets being turned into plastic items such as benches, watering cans and plant pots by recycling firm TerraCycle. Mr Ashcroft, whose petition against the Leicester-based crisp maker has been signed by more than 330,000 people, said the announcement was "really exciting". "I hope other snack companies get on board," he said. "This is a great first step and makes all the work that's gone into the petition worthwhile." But the firm "still have a lot to do to meet their pledge of making their packaging fully recyclable, compostable or biodegradable [by 2025]", Mr Ashcroft added. Campaign group 38 Degrees, which previously encouraged people to post their crisp packets back to the company, said it was "delighted" to hear about the scheme. "It's proof that public pressure can shift big companies to do more to prevent waste," said executive director David Babbs. "The public will be watching to make sure that the new recycling scheme isn't just a PR stunt," he added. Walkers described its partnership with TerraCycle as "the UK's first nationwide recycling scheme for crisp packets". Any brand of crisp packets - not just Walkers - will be accepted. The scheme is due to start in December. Walkers' packets are made from a fusion of plastic and aluminium foil. Crisps are packaged like this by many manufacturers because of their high fat content, which means they can quickly go rancid when exposed to oxygen. Walkers said its packets are technically recyclable, but until now they were not being separated or collected for recycling. Ian Ellington, general manager of Walkers' owner PepsiCo UK, said: "We share people's concerns about the amount of plastic in our environment and are working on a number of both short and long-term solutions to reduce the impact of our packaging." Want to keep up with the news about all things to do with Climate Change ?...……. Then, you may want to consider subscribing to 'Carbon Brief' - for a daily or weekly round-up . According to Anton Page: "It's easy to subscribe and contains loads of interesting stuff". For those of you who don't know, Waterside Scrapstore can be found at 12-14 Rumbridge Street in Totton. Membership is open to anyone who does craft with children - from Grandparents to Schools. ​Although many of the scrap suppliers are local companies who donate their surplus/substandard/damaged stock, this is also an outlet for individuals to donate things which "are too good to go in the bin" or "could be made into something". Apart from packaging which has contained meat, the scrapstore will accept pretty much anything - from scraps of material to margarine tubs. You would be amazed what can be made out of scrap. ​Currently there is an appeal for wool - of any type or amount - so if you have some left over from your yarn-bombing, then you know where to take it. for more details and opening hours. Sainsbury's will make a donation to FSC UK based on the volume of cards collected between 26 December and 8 January. Sainsbury’s is providing an in-store Christmas card recycling service to support FSC UK to help protect the world’s forests. Until 8 Jan 2018, customers can recycle their Christmas cards via an in-store collection point. Sainsbury’s will recycle all collected Christmas cards and make a donation to FSC UK in the New Year. Last year, customers donated more than 98 tonnes of cards. Old 'paper' Christmas wrap and defunct Christmas lights can also be recycled via the collection points. What do you do with a broken toaster, a skirt that needs a new zip or a hair dryer that’s on the blink? If your answer is bin it, then think again because Andover has started a monthly Repair Café. ​Hosted by Andover Mind, at the Well-Being Centre in Westbrook Close, South Street, Andover. The Repair Café concept started in the Netherlands in 2009 and was founded by Martine Postma, at the time an Amsterdam-based journalist/publicist. In 2010, she started the Repair Café Foundation. This foundation provides support to local groups around the world wishing to start their own Repair Café. Look for the recycling sign on the plastic film to see if it is recyclable and remember, anything put for recycling should be 'CLEAN & LOOSE'. 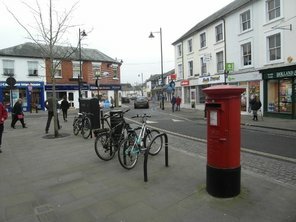 ​Transition Town Romsey's input to the ongoing Romsey Futures Cycle Parking project.